How To Save Money for Rapid Prototypes Manufacturing? Sometime, we have been got complaints from one of a few our customers. “why the sample cost is so much”, and “why would a simple sample cost us hundreds of dollars?” Almost all customers have similar confusion and puzzles for CNC machining prototypes making. Today, Creatingway will share several tips help to save cost for your rapid prototypes manufacturing, in order to launch your new projects to marketing. Meticulous in planning is critical for one buyer or inventor. Before started any CNC machining project, it is critical to be meticulous in planning as this can save your money and a lots time in the long run. And ensure the part drawings are feasible and approved by the professionals before making the sample. Don’t need to take extra time and cost to continuously modify the final designing of the parts. And building appropriate facilities for the parts before production, make sure each of process control of importance to each of steps in order to save costs. As for the CNC machining process, we firstly need to review and judge which one kind of machining processing is the most suitable our customer requirements. It not only can save the whole machining time, but also effective control the quality of the parts. Based on the different functions and applications of the parts, we need to choose the most available and cheapest material, and it can still meet your design requirements with the same intended results. Such as: Aluminum, ABS etc. Of course, for many precision medical devices or Aerospace parts, we can choose pricier material. like: Stainless steel etc. Anyway, Selecting suitable the material of rapid prototypes manufacturing to save the costs, and ensure the high of the parts is our purpose. Every day, we have got a lots of inquries from designer, product engineer or buyer for the ideas or inventions. But not all parts are perfect and no need to be modified before the prototypes. Since there are some ideas or inventions are designed by designer or End-consumers. They lack of some machining experience and knowledge, and only look at a part from an aesthetic point of view, so that the structure of the final drawings are complex or redundant for production, these drawings may be at risk of not being produced, or need to renew designing or modification before production. 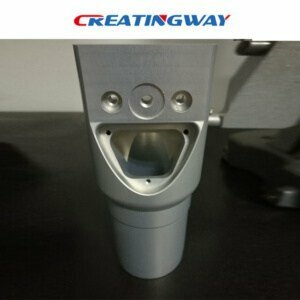 Usually at this time, as one professional CNC Machining manufacturer, Creatingway have own one professional Development& Designing team to service for our customers. We always provide the best suggestion and machining processing for our customers. Modify some of the edges or angles to reduce the costs without affection the functions and applications of the parts also is crucial.